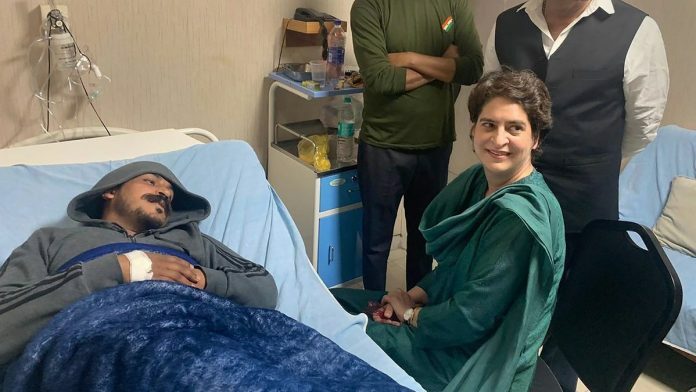 Lucknow: A day after Bahujan Samaj Party chief Mayawati ruled out any alliance with the Congress anywhere in the country, Priyanka Gandhi Vadra visited Bhim Army chief Chandrashekhar Azad in a Meerut hospital. The move is being interpreted in political circles as an attempt by the Congress to wean away a section of Dalit votes from the BSP. Azad, an emerging young Dalit leader from Saharanpur, told NDTV after the meeting that he would contest against Prime Minister Narendra Modi in Varanasi, and sought support from parties that wanted to defeat him. The Bhim Army had earlier ruled out the possibility of entering the electoral fray, and extended support to the BSP-Samajwadi Party alliance. “She said ‘bhai, kaise ho? (brother, how are you? ),” Azad said about his five-minute meeting with Priyanka, the AICC general secretary in charge of eastern Uttar Pradesh. She told reporters later that she was there to extend support to Azad, “a youngster who is being crushed” for raising his voice. Priyanka, who was accompanied by her western UP counterpart Jyotiraditya Scindia and state Congress chief Raj Babbar, denied there was any political talk during the meeting. Azad had come into the limelight following his arrest in June 2017, in connection with caste violence in Saharanpur. The police had slapped the National Security Act against him, drawing criticism from many quarters. He was released after over a year. The Bhim Army chief has been trying to mobilise Dalits in UP and other states, and was detained along with nearly 100 supporters in the Deoband area of Saharanpur district Tuesday for allegedly violating the Model Code of Conduct. He was rushed to a Meerut hospital as he took ill after being detained. Azad once called Mayawati his bua (paternal aunt), saying they might have the “same blood”. His remarks had not gone down well with the former UP chief minister, who retorted that she had no association with a person who indulged in violence and formed a separate outfit for the welfare of Dalits. While the BSP chief has been vocal about her criticism of the Congress party, she ended all speculation about Congress’ joining the SP-BSP alliance Tuesday. In an official statement, Mayawati said her party would not ally with the Congress in any state for “petty electoral gains” in the upcoming general elections.